This month's theme is "Big." 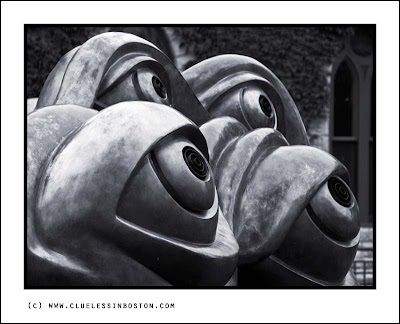 My contribution is Lousie Bourgeois’s Eyes on the campus of Williams College. You can click here to view thumbnails for all participants. I discovered Williams some 35 years ago (is that possible?) in the college counc. office. I really wanted to go there but my parents would have none of that. My closest friend DID go there for her first 2 years & I did get a chance to visit the campus about 15 years ago. Fantastic work from both the artist and the photographer. A really Big one! Cheers! Big eyes indeed, very good choice! It has worked really well in m onochrome. I think that would give me a creepy feeling, like I was being watched or something, LOL. Haha! I was going to use these for my 'big'. So you did make it to Williams. Great choice, obviously! But now I have to put my thinking cap on and use something else. Those are some very BIG eyes! BIG, scary eyes! Nice BIG theme photo! Great photo in B & W. Even better when viewed larger! Louise Bourgois is always a surprise. And your choice, and the angle of the photo, were priceless! I loved it! In fact, remind me of medieval monks, startled by some religious revelation! I agree with Hilda on the ninja turtles! This is a wonderful Theme Day post! Very "eye" catching photo. Many of my friends attended Williams. A wonderful school. I love it. great choice and stunning composition. Very cool! I think this is my favourite of the day. Great! those eyes seem to see something strange or ..big too! Great photo, and such big eyes;-)wow! Your photo certainly caught my eye in a big way! Wow! Big big inquisitive eyes, excellent choice. This is a very appropriate choice, for sure! Great photo. I hope they do not turn those enormous eyes towards me.